Waist Suit and Lined Jacket Buy Now! The elastic waist pants coupled with our lined jacket, make a fantastic weatherproof rainsuit for every outdoor enthusiast. 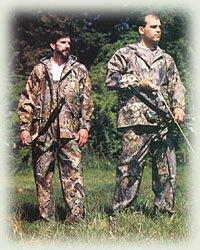 Waist pants provide superior protection from rain or damp weather while hunting, fishing or hiking. This solid rainsuit includes durable elastic waist pants that feature tapered legs that close against the elements and a lightweight lined jacket. Both waist pants and lined jacket feature durable, breathable fabric and include spacious storage pockets.